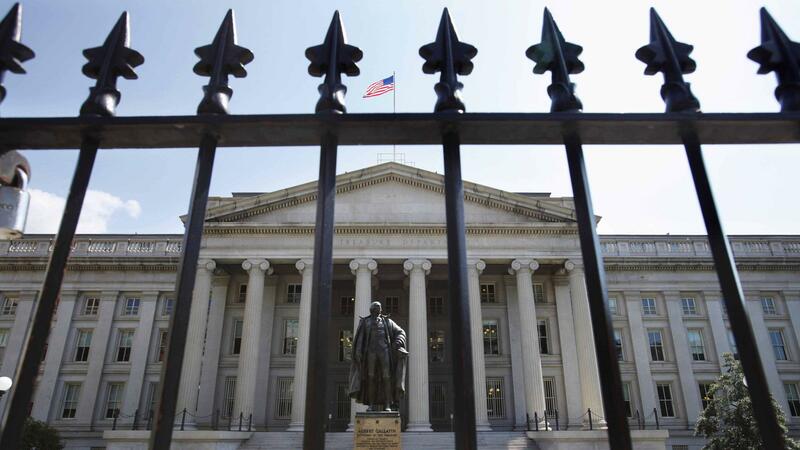 A statue of former Treasury Secretary Albert Gallatin stands guard outside the Treasury Building in Washington. Trump's campaign plans for a total overhaul of the U.S. tax code — while maintaining the revenues flowing into the federal government — may have missed their chance in Congress. If you filed for an extension on your taxes this week, you're right in step with the Trump administration and Republicans in Congress. They've put off voting on their promised tax overhaul until after they take another whack at repealing and replacing Obamacare. That's got some Republicans concerned, including Stephen Moore, who was an economic adviser to the Trump campaign. "You know, you've got a period when you're first elected where you've got to rush and get things done before that window slams shut," Moore says. But Moore says that as of mid-April, President Trump has no legislative victories, and his Treasury secretary, Steve Mnuchin, says a tax cut will have to wait until the fall. Moore says Trump needs a win and should push a tax right now. "Do something that's achievable," he says, pointing out that Trump ran on a corporate and business tax cut. "Get that done. This is taking too long and it's getting harder to do as each week goes by." Moore does have some skin in this game: He's co-author of the tax overhaul plan Trump ran on during the election. But nearly 100 days into his administration, Trump hasn't sent Congress that or any other tax plan. Moore says the lack of a tax bill already is having negative effects: Growth seems to be slowing, and the latest monthly jobs numbers for March were disappointing. When he talks to investors and businesses and asks why things seem to be slowing, they say they're getting nervous that Trump's tax cut may not happen. Jon Traub, a former Republican staff director at the tax-writing House Ways and Means Committee, says the outlines of a Trump tax bill are still unclear. "We're still waiting to figure out what President Trump is going to embrace," says Traub, who's now at the consulting firm Deloitte. The biggest question, he says, is whether Trump will get behind the controversial border adjustment tax. It's a key element of a dramatic plan supported by House Republican leaders to overhaul the tax code. The proposal, a 20 percent tax on all imports, is attractive because it would raise a huge amount of revenue. The plan would simultaneously eliminate taxes on American exports. The proposal has divided the U.S. business community. Not surprisingly, retailers like Wal-Mart that import products they sell, hate it. On the other hand, exporters like Boeing love it. "The president has given mixed signals on that issue," Traub says. "I think it's fair to say without his active support, that proposal probably cannot pass the House or Senate." If Trump doesn't support the border adjustment tax, he would need to find some other way to raise the hundreds of billions of dollars in revenue needed to cut tax rates without adding to federal budget deficits. The White House has floated several ideas for getting that revenue, including a carbon tax and a value-added tax (VAT); neither previously has had much Republican support. Traub says that "shows how desperate" the administration is to find a large source of revenue, "other than the border adjustable tax, as a way to finance lower corporate tax rates." Moore, the Trump campaign adviser, says it's time to stop worrying about whether tax cuts will add to budget deficits. And for now, Moore says, Trump should forget about doing a big complicated tax overhaul. "One of the lessons, hopefully, Republicans learned from the health care debate is, 'keep it simple, stupid,' " he says. "The fewer movable parts, the easier it is to get it through Congress." Allow businesses to immediately deduct the full cost of capital purchases, such as factories and equipment. Cut the corporate tax rate from 35 percent to 15 percent. Have an even lower tax rate on money U.S. companies bring revenues back from overseas. Require that some of that repatriated money be used to improve U.S. infrastructure. Moore and other prominent Republicans pushing these ideas, including publisher Steve Forbes and economists Larry Kudlow and Arthur Laffer, say even some Democrats might support them. (SOUNDBITE OF MARCUS STRICKLAND'S TWI-LIFE'S "CELESTELUDE") Transcript provided by NPR, Copyright NPR.